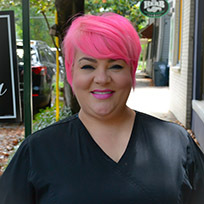 Leslie LaBruzza is a licensed esthetician. She’s an Aveda Institute of New Orleans graduate. Leslie has a strong passion for all aspects of the beauty industry but specializes in the art of body waxing for males and females. She prides herself in always doing a thorough and remotely pain free waxing service. After years of working strictly as a waxologist, she has decided to embrace all services under the scope of her licensure. Her BIG personality is nothing compared to her heart. Leslie’s clients love her and have labeled her as their friend and “waxing ninja”.